Owning a looper pedal is a great advantage for guitar players – both in performance and practice and there’s a huge range on the market today. It can be overwhelming choosing the best looper pedal for your needs, so in this post, I’ll be rounding up 8 of the most popular models currently available. Each pedal here has it’s own benefits and drawbacks and with a closer look, this post should help you reach a more informed decision as to which one you want to go for. 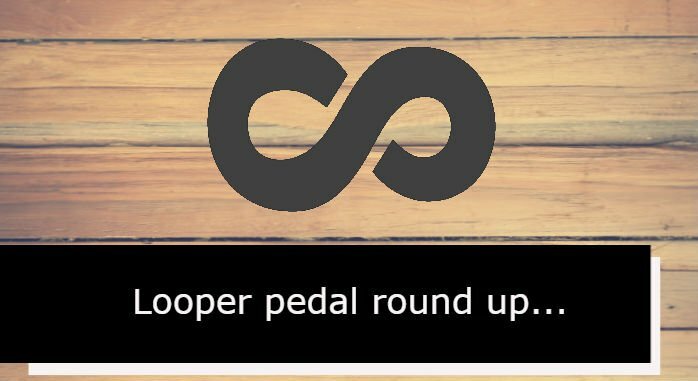 For this review, I’ll be focusing mainly on pedals which do just that – loop! Some delay pedals offer looping functions although these are generally quite limited. Over the £200 / $270 mark, you’ll see loop pedals featuring multiple looping tracks allowing for greater control, built-in effects and computer integration too. The main players in this range come from Boss, Digitech, TC Electronic and Electro Harmonix. 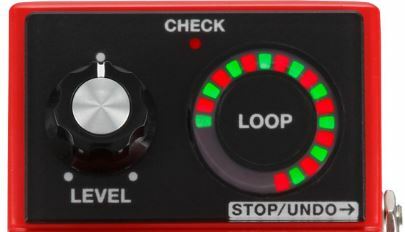 A great feature of the RC-1 is the LED loop display which shows what mode is currently in use: (play = green, record = red, overdub = red & green). This is also useful when aiming to record the perfect take and playing along to your previous recorded loop. The visual count down helps you to keep track of where the start of the loop is. The RC-1 features the usual ‘tank-like’ construction as with all of Boss’ single stomp boxes. There is just one knob to adjust the volume level of the loop being played back. A common misconception online highlights issues with the unit going out of sync or not functioning properly, however there is a hidden second ‘mode’ which once understood should clear this up. This order be changed however, by powering up whilst holding down the pedal, then clicking through so the lower half of the LED ring lights up. The order of functions changes to record, play, overdub, a slightly confusing way to switch modes but is documented in the manual non the less. Undo and redo functions are available and accessed while in overdub or playback mode only, by holding the pedal down for 2 seconds or more. Undo will delete the last loop you recorded – to restore it, hold down the pedal again for two or more seconds. 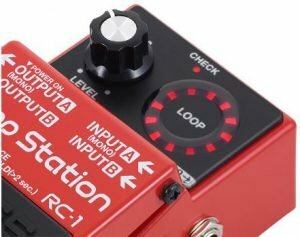 Unlike other simple loop pedals, the RC-1 features stereo inputs and outputs, particularly useful for keyboard players and the optional foot switch for stop/undo functions makes using it even easier, helping to avoid clearing loops by accident. The unit can be powered by a regular 9 volt battery although due to its high power consumption an optional Boss PSA series power supply is recommended. 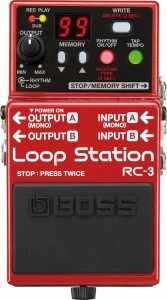 I’d recommend the RC-1 to anyone looking for a simple but effective looper. It’s helpful loop indicator display is a great touch and will help beginner guitarists in particular – making it easier to use as a practice buddy. The RC-3 is packed with useful features – the most useful in my opinion are the ability to save separate loop phrases in the on board storage and the option to import and save your own .wav files. This is a great advantage for anyone who wants to perform live with the RC-3. 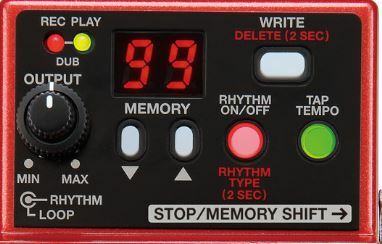 There are 99 memory slots in total with 10 ready made rhythm phrases pre loaded in 90-99. These can either be used as a metronome for practice as well as jamming, playing live or building ideas as soon as inspiration strikes. A dot at the bottom right of the display indicates that the current slot holds audio data. 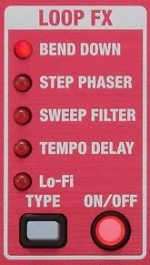 To change this order, hold the tap tempo button down and insert a jack plug into output A. The up and down arrows below the display can then be used to change the order. Pressing tap tempo again confirms and returns to normal function. The option to import your own .wav files and save in the built in memory slots is a great addition. This allows you to play along in a live setting with your own pre-prepared backing tracks – a great advantage for solo players or singer songwriters. The auto record feature really takes the hassle out of recording a perfect loop first time. You can set it to detect the first moment of sound coming from your instrument, helping you to stay focused on your playing. 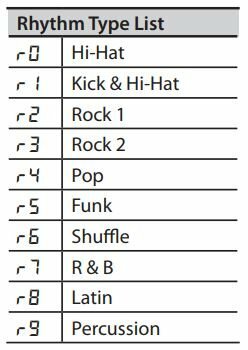 There is also an option to have a one bar count-in using the on board rhythm phrases. The RC-3 features a ‘sleep’ mode which kicks in after 10 hours of inactivity. This can be bypassed by holding down the pedal for 5 seconds whilst inserting a jack plug into input A. The display will flash ‘_ _’ once this happens, release the pedal and normal function will resume. The RC-3 has many useful functions – a great tool for guitarists or songwriters looking to archive loops and ideas to computer storage (via the USB2 connection). There is a greater focus on using the pedal for live performances too – built in drum tracks, the option to import your own .wav files and the aux input could give you the edge at any gig or open mic night, just remember to take your power supply! A feature packed pedal, the RC-30 has been the go to live looper for countless musicians since it’s release back in 2011. Although it may seem daunting at first for beginners, learning it’s intuitive layout and features are definitely worth the extra effort initially. The RC-30 is the most feature packed pedal in this review – although I wanted to focus mainly on simple pedals, this one falls within the price range of this group and shares many of the features of the RC-3 with a few added bonuses. 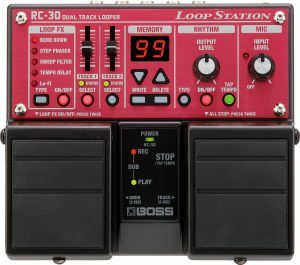 The obvious thing you’ll notice with the RC-30 though, is it features two foot switches as well as two completely separate tracks you can record phrases on to. 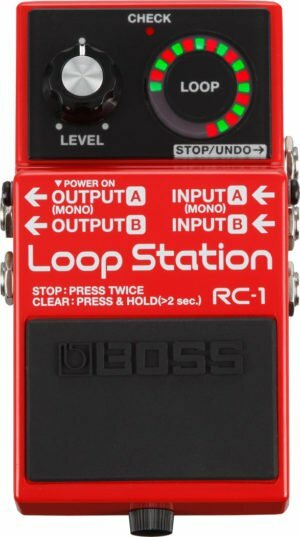 This is a great help if you’re using the looper for live performances – being able to stop and start loops on a dedicated foot switch really makes life easier. The RC-30 features two independent tracks which are armed for recording using the select buttons below each volume slider. It can aid creativity too as it allows you to create two separate loops for different parts of a song for example. If you’ve recorded a loop in a memory slot already – 1st press will play back and second press activates record for overdubbing. Undo and redo functions are also activated with the left pedal during play back or overdubbing by pressing and holding down for more than two seconds – this will cancel the most recent recording. The loop FX section can be turned on or off by pressing the left pedal twice. Pressing the right pedal once will stop the play back, press it twice stops all play back if both tracks are in use. Like the RC-3, tap tempo can be set although instead of using a button, you can use the right pedal by pressing repeatedly to the desired tempo. This will then sync the build in rhythm tracks to match your speed. You can also switch between which track is record enabled by holding down for a minimum of two seconds. The RC-30 is the only looper in this round up that features a dedicated Mic input. A welcome addition for anyone planning to use it live, adding vocals to your loops adds another dimension to performances, you could layer loops to build harmony parts and also run them through the built in effects section. The effects section features a type button to scroll through the five on offer, and an on/off. The RC-30 has been on the market a while now but still a very popular choice – the features on offer along with the reasonable price make it a worth while consideration in my opinion. The unit can run on 6xAA batteries (Boss claim for around seven hours) although for best performance a power supply is recommended, so you may want to factor that in to your budget too. The RC-30 shares its features with the RC-3 and adds to them so the same uses apply. Live performers and songwriters will find this pedal of great use, especially with the mic input and easier looping control with the dual pedal set up. 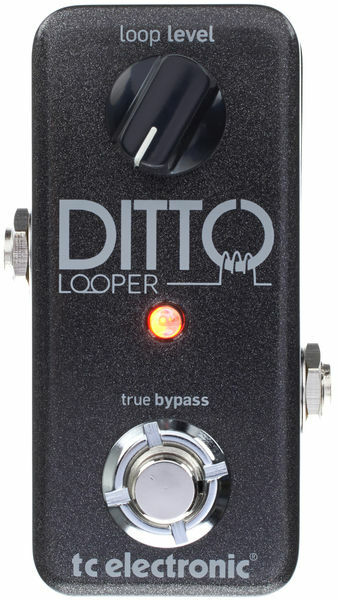 TC Electronic have gone back to basics and focused on simplicity with their Ditto looper. They mention on their website that the Ditto was “..designed by guitarists, for guitarists...” In other words they have gone for audio quality and intuitiveness rather than storage space, effects and non-essential extras. Its true that most guitarists are on a quest for the perfect tone – so to have a loop pedal in their collection that features the highest quality recording and play back with zero loss of tone, is a great bonus. 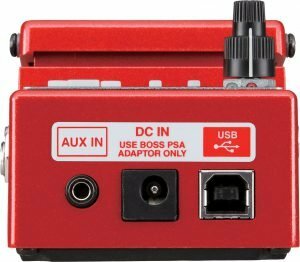 Unlike the RC series from Boss, the Ditto features 24 bit record and playback of loops. Without going in to too much depth here, this will enhance the quality of sound by converting your analog guitar signal to a digital one with greater accuracy. The advantages of this are clearer tone with the digitally recorded loop reproduced as close as possible to the original signal. Depending on how ‘trained’ your ears are, this may not be a huge deal to you – everyone hears things slightly differently – although for more established players, this will give the reassurance that your tone stays intact. The Ditto also features true bypass – which ensures no loss of tone when the pedal is in the ‘off’ position. There is one control knob, which controls the overall output of the pedal and all functions are controlled through just one foot switch button (no optional foot switch inputs available with the Ditto). There is no facility to change the order of functions like in the RC-1 and RC-3 – its more of a one size fits all approach. Once you have a loop recorded you can pause its play back by double pressing in quick succession. The LED indicator will flash green when paused and will play back from the start of the loop the next time you press once. I was struck with confusion on first auditioning my Ditto in store – I pressed to record a phrase but heard back a previous customers loop! Although the pedal has no dedicated storage for loops, I was hearing the last loop it recorded as the pedal does retain the last loop in its internal memory until you press and hold to clear it. The main selling points for the Ditto are its high sound quality and simple intuitive function. With 24 bit uncompressed audio and true bypass you can rest easy knowing that your tone is all you will hear. Its small footprint will squeeze into smaller areas – appealing to those with crowded pedal boards. Recording the perfect loop with the single foot switch will take a bit of practice, more experienced players shouldn’t struggle too much though.